Richard Feynman was a Nobel Prize-winning American physicist, particularly known for his contributions to quantum physics, quantum electrodynamics and particle physics, as well as quantum computing and nanotechnology. During his lifetime, he was one of the best-known scientists in the world, and was a great popularizer of physics through his books and lectures. He was also regarded as something of an eccentric and free spirit, and brought a wicked sense of humour to his work, as exemplified by his well-known quote “I think I can safely say that nobody understands quantum mechanics”. Richard Phillips Feynman was born on 11 May 1918 in Queens, New York to Jewish parents originally from Russia and Poland. As a child, he was heavily influenced by both his father, Melville, who encouraged him to ask questions to challenge orthodox thinking, and his mother, Lucille, from whom he inherited the sense of humour that he maintained throughout his life. His sister Joan also became a professional physicist. 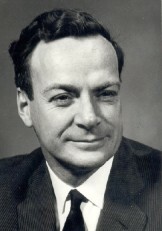 By his early youth, Feynman described himself as an "avowed atheist". He delighted in repairing radios and demonstrated a talent for engineering from an early age. At Far Rockaway High School in Queens, he excelled in mathematics, and won the New York University Math Championship by a large margin in his final year there. He was refused entry to his first choice Columbia University because of the "Jewish quota" and attended instead the Massachusetts Institute of Technology, where he received a bachelor's degree in 1939, and was named a Putnam Fellow. He obtained an unprecedented perfect score on the graduate school entrance exams to Princeton University (although he did rather poorly on the history and English portions), where he went to study mathematics and physics along with other luminaries such as Albert Einstein, Wolfgang Pauli and John von Neumann. He received a PhD from Princeton in 1942, under his advisor John Wheeler, with a thesis in which he developed an approach to quantum mechanics governed by the principle of “least action”, replacing the wave-oriented electromagnetic picture developed by James Clerk Maxwell with one based entirely on particle interactions mapped in space and time. During his time at Princeton, he married his first wife, Arline Greenbaum, although she died of tuberculosis just a few years later in 1945. A second marriage, in June 1952, to Mary Louise Bell, was brief and unsuccessful. While at Princeton, Feynman was persuaded by the physicist Robert Wilson to participate in the Manhattan Project, the wartime US Army project at Los Alamos to develop an atomic bomb. Although not central to the project, he immersed himself in this work, and was soon made a group leader under Hans Bethe, and was present at the Trinity bomb test in 1945. As part of the project, he assisted in establishing the system for using IBM punched cards for computation, and in calculating neutron equations for nuclear reactors. Later, at the US Army’s Oak Ridge facility, he devised safety procedures for atomic material storage, and did theoretical work on the proposed uranium-hydride bomb, which later proved not to be feasible. He also gained a reputation for his pranks and practical jokes, and for his habit of Indian-style drumming out in the desert. During his time at Los Alamos, Niels Bohr sought him out for discussions about physics, and he became a close friend of laboratory head Robert Oppenheimer, who unsuccessfully tried to lure him to the University of California in Berkeley after the war. Looking back, Feynman thought his decision to work on the Manhattan Project was justified at the time, but expressed grave reservations about the continuation of the project after the defeat of Nazi Germany, and suffered bouts of depression after the destruction of Hiroshima. After the war, Feynman declined an offer from the Institute for Advanced Study in Princeton, New Jersey, despite the presence there of such distinguished faculty members as Albert Einstein, Kurt Gödel and John von Neumann. Instead he followed Hans Bethe to Cornell University, where he taught theoretical physics from 1945 to 1950. Feynman then opted for the position of Professor of Theoretical Physics at the California Institute of Technology (partly for the climate, as he admits), despite offers of professorships from other renowned universities. He remained there for the rest of his career. In California, he married for the third time, to an English woman called Gweneth Howarth who shared his enthusiasm for life and spirited adventure. In 1962, they had a son, Carl, and adopted a daughter, Michelle, in 1968. Carl inherited his father’s love of, and propensity for, mathematics and went on to work at a high level in the computer field, particularly in the use of multiple computers to solve complex problems, later known as parallel computing. Feynman gained a reputation for being able to explain complex elements of theoretical physics in an easily understandable way, and was sometimes referred to as “The Great Explainer”. He opposed rote learning or unthinking memorization, although he could also be strict with unprepared students. His 1964 book “Feynman Lectures On Physics”, which includes lectures on mathematics, electromagnetism, Newtonian physics, quantum physics and even the relation of physics to other sciences, remains a classic. Other lectures and miscellaneous talks were also turned into books, including “The Character of Physical Law”, “QED: The Strange Theory of Light and Matter”, “Statistical Mechanics” and “Lectures on Gravity”. In December 1959, Feynman gave a visionary and ground-breaking talk entitled "There's Plenty of Room at the Bottom" at an American Physical Society meeting at the California Institute of Technology. In it, he suggested the possibility of building structures one atom or molecule at a time, an idea which seemed fantastic at the time, but which has since become widely known as nanotechnology. He personally offered $1,000 prizes for two of his challenges in nanotechnology, which were claimed by William McLellan and Tom Newman. He was also one of the first scientists to conceive of the possibility of quantum computers and played a crucial role in developing the first massively parallel computer, finding innovative uses for it in numerical computations, building neural networks and physical simulations using cellular automata. During his years at Caltech, he worked on, among other things: quantum electrodynamics (the theory of the interaction between light and matter) which he had begun developing at Cornell, and for which he was awarded the 1965 Nobel Prize in Physics jointly with Julian Schwinger and Sin-Itiro Tomonaga; the physics of the superfluidity of supercooled liquid helium and its quantum mechanical behavior; a model of weak decay (such as the decay of a neutron into an electron, a proton and an anti-neutrino) in collaboration with fellow CalTech professor Murray Gell-Mann; his parton model for analyzing high-energy hadron collisions, which he developed in parallel with Murray Gell-Man’s theory of quarks (although the quark model would be the one to gain general acceptance). In his work on quantum electrodynamics, he developed an important tool known as Feynman diagrams to help conceptualize and calculate interactions between particles in space-time, notably the interactions between electrons and their anti-matter counterparts, positrons. Feynman diagrams, which are easily-visualized graphic analogues of the complicated mathematical expressions needed to describe the behavior of systems of interacting particles, have permeated many areas of theoretical physics in the second half of the 20th Century. His ambitious idea was to use the diagrams to model all of physics in terms of particles' spins and fundamental forces, and to explain the strong interactions governing the scattering of nucleons. He was appointed a foreign member of the Royal Society in 1965, and later won the Oersted Medal for teaching, of which he seemed especially proud. He also became a member of the American Physical Society, the American Association for the Advancement of Science and the National Academy of Science. Later in life, Feynman turned his mind to theories of quantum gravity. Although not developed for the purpose, his Feynman diagrams had became fundamental for developing string theory and M-theory. He was not, however, totally convinced by the theories, and criticized string theorists for “not calculating anything” and for not checking their ideas.